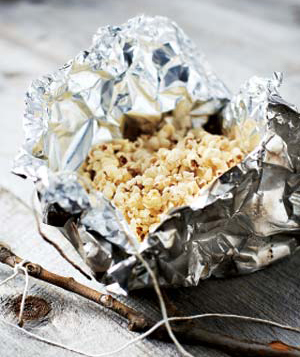 In the center of an 18″ x 18″ square of heavy-duty or doubled foil, place one teaspoon of oil & one teaspoon of popcorn. Bring foil corners together to make a pouch. Seal the edges by folding, but allow room for the popcorn to pop. Tie each pouch to a long stick with a string & hold the pouch over the hot coals. Shake constantly until all the corn has popped. Season with butter and salt. Or we season ours with Parmesan cheese. Ta da! Your own individual popcorn serving. Involve the kiddos by allowing them to help shake the corn. Its way more fun than Jiffy Pop. – Recipe courtesy of Razzle Dazzle Recipes. It’s almost that time of the year … Lake Rudolph’s Halloween Weekends! Never been a guest during that time? Halloween Weekends are seven Halloween themed weekends that take place in September and October. Many families have made it a family tradition and visit us each year for these fun fall weekends. Here’s a slideshow photo tour so you can get a taste of what these weekends are all about. We offer a variety of activities such as HalloTeen games, Rudy’s Kid’s Carnival, site and costume decorating contests, bonfire ghost stories, trick-or-treating, frightful film classics and more! Sites and rentals are still available for late September and early October … but you’d better hurry. You can call Reservations Monday through Friday from 8:00am – 4:30pm CT at 1-877-478-3657 or reserve online. Since Wednesday was National S’mores Day, I thought we’d share a recipe that I came across for S’mores Brownies. How can you go wrong? 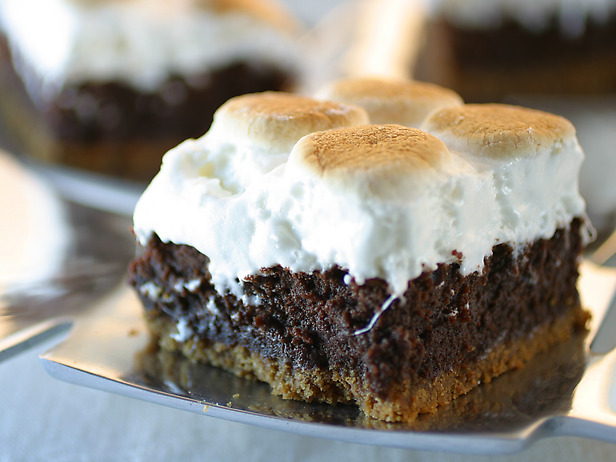 Brownies and s’mores together … it’s perfect harmony. Heat oven to 325 degrees F. Take a 8″ x 8″ square pan and line is with foil. Make sure the foil hangs over the edges by an inch. To make the crust … lightly butter the foil with some of the melted butter. In a medium bowl stir the rest of the butter together with the crumbs, sugar, and salt in a medium bowl. Press crumb mixture evenly over the bottom of the pan. Bake approximately 20 minutes or until golden brown. Next, make the brownie. Put the butter and chocolate in a medium microwave safe bowl. Melt in the microwave on for 2 minutes. Stir, and microwave again until completely melted, about 2 minutes more. Put the butter and chocolate in a heatproof bowl. Fill a saucepan with about 1 inch of water and bring it to a very slow simmer. Set the bowl on the pan without touching the water. Stir until melted. Stir the light brown sugar and white sugar, vanilla and salt into the melted chocolate. Add eggs and beat vigorously to make a thick and glossy batter. Add the flour and stir until just mixed. Pour batter into prepared pan. Bake until the top is crispy and a toothpick inserted into the middle comes out mostly clean, may have a few crumbs. Approximately 40 to 45 minutes. Remove from the oven and carefully position a rack about 6 inches from the broiler and preheat on low. Layer marshmallows across the top and toast under the broiler until golden,. Watch it closely because it can brown up quickly, about 2 minutes. Cool on a rack, gently removing the brownies from the pan using the aluminum flaps. Carefully separate any marshmallow from the foil and fold away. Cut into 12 squares. I can’t believe I never thought about grilling a peanut butter sandwich. Now that I’ve heard about it, I feel like these sandwiches have been missing from camp outs my whole life!! Spread peanut butter on a slice of bread, just like you normally do. Add a second slice to make the sandwich. – Recipe courtesy of QuietJourney.com.